A week ago we (I) were making milkshakes (reward for being such good girls and cleaning the flat, hah!) - but something went wrong in the process (ratio, to be specific), and it turned out a bit .. thick. Christine insisted it was a kodak moment and took pictures of the result using my camera. 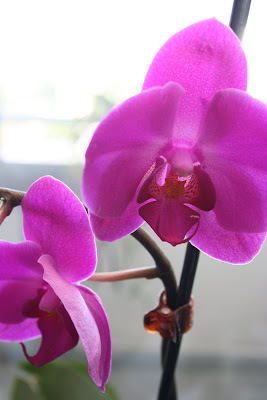 But this week one of my orchids that came back after dying completely last year when I bought it decided to flower. Pretty! Oh and I have a new job, starting monday and I was told I got it 3pm friday. Things move quick! Same company, same department though. Milkshaken ser smarrig ut, blomman är jättevacker! Vad har du för jobb ?? Och - grattis! Dessutom så vill jag nämna att "milkshaken" ser alldeles perfekta ut! Så ska glass/milkshake se ut!!!! och jag skulle inte tacka ej till jordgubbarna ovan!